Environmental groups hired a private firm after the flooding and found higher than normal levels of dangerous chemicals in the air around a refinery. Correction: An earlier version of this story described TCEQ's air monitoring unit as being capable of collecting data in "real-time." The unit does not provide real-time data. 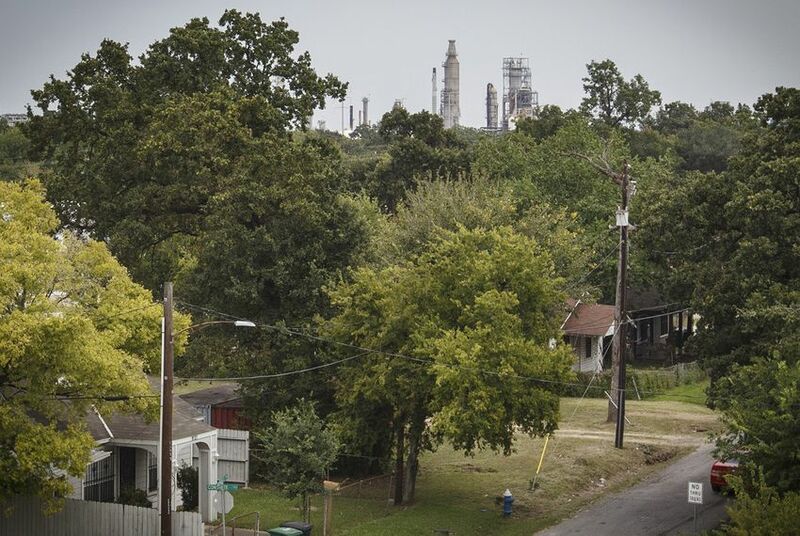 As a longtime resident of Manchester, Guadalupe Hernandez is used to the chemical smells that waft through his southeast Houston neighborhood, a low-income, predominantly Hispanic community near a Valero Energy refinery. But when Hurricane Harvey blew in the weekend of Aug. 26, the stench became noticeably stronger for about five hours, a scent like “glue or boiled eggs,” he said. The Environmental Protection Agency has assured the public they looked into complaints in the area a week after the storm hit, and spent several days taking air pollution measurements with a mobile laboratory. The agency didn’t release any specifics, but said concentrations of several toxic chemicals, including the carcinogen benzene, met Texas health guidelines. 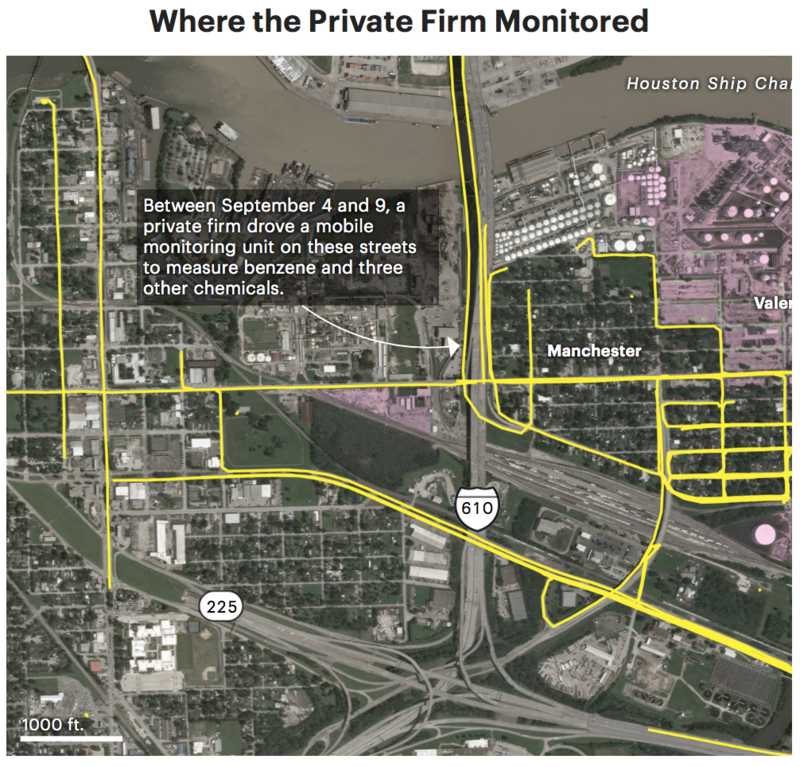 Now, environmental advocacy groups have shared their own, detailed data with ProPublica and the Texas Tribune, based on air sampling from the same Manchester streets over six days. It shows a more nuanced picture than the one given by the EPA: in numerous locations, benzene levels, though under the Texas threshold of 180 ppb, far exceeded California’s guideline, which is 23 times more stringent and is well-respected by health advocates nationwide. About 10 of the benzene measurements exceeded California’s limit of 8 ppb. (Neither California’s nor Texas’ guideline is legally enforceable; both are thresholds that can trigger regulatory scrutiny). 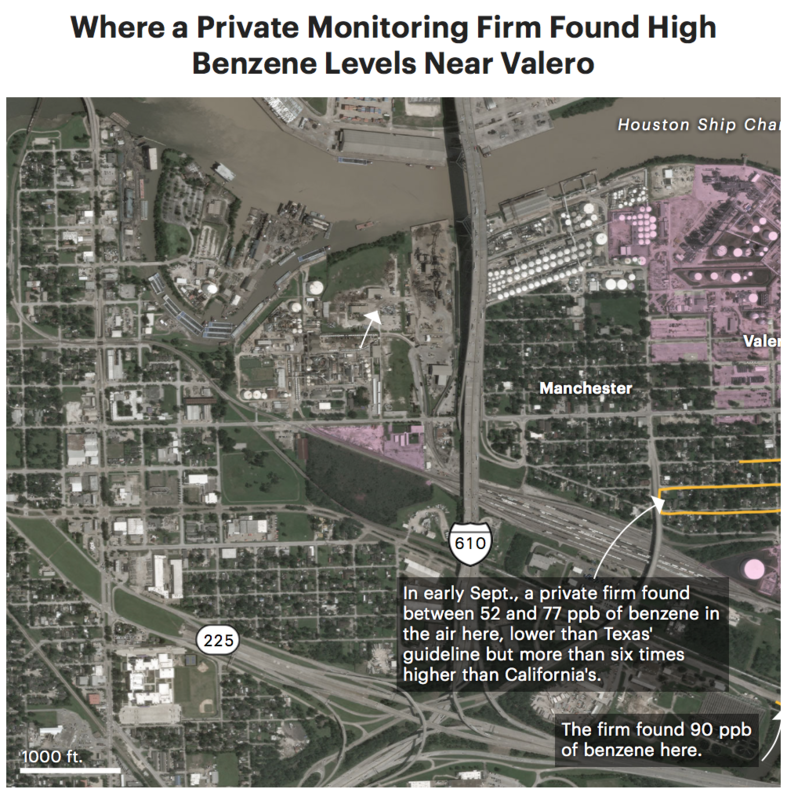 The two highest benzene concentrations, 90 and 77 ppb, were detected within 1,600 feet of a damaged storage tank at the Valero refinery. At the time the data was collected, the wind was blowing from the direction of the tank toward the monitoring sites. Valero reported on Aug. 27 that the rain from Hurricane Harvey had submerged the tank’s floating roof, releasing benzene and crude oil. Satellite images from Aug. 31 released by DigitalGlobe show the caved-in tank at the refinery. Air pollution experts say much of the benzene would have dissipated by the time the advocates began monitoring on Sept. 4. The EPA started its sampling a day later. 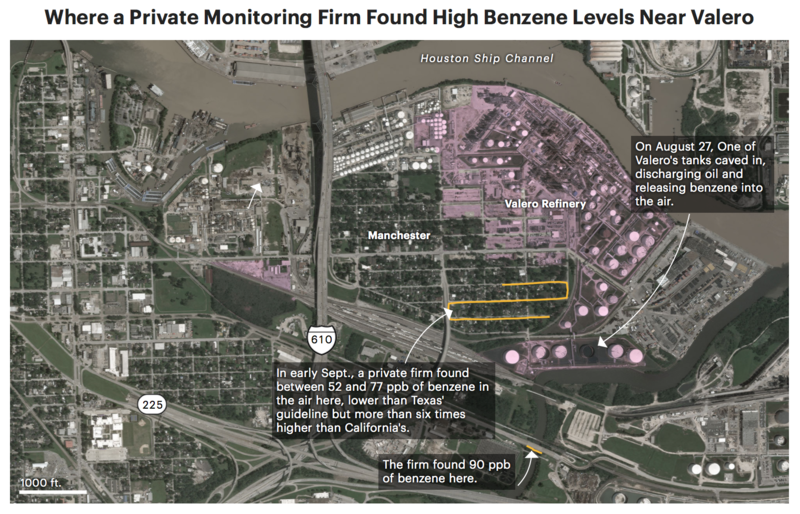 Days before either monitoring effort, the city of Houston detected a single benzene concentration of 324 ppb in Manchester. Hernandez said he believes the fumes he noticed during the hurricane came from the refinery. Margarita Zepeda, another Manchester resident, also remembers a strong smell during the storm. “During normal rains it would never smell bad but during [the hurricane], it did — chemicals, I guess. And I’m not the only one. All the neighbors” could smell it, too,” Zepeda said. The EPA said in a statement they inspected the refinery last week and were satisfied the company was making the necessary repairs. Valero did not respond to a request for comment. Craft said EDF and Air Alliance Houston decided to take air samples after the hurricane triggered the release of millions of pounds of air pollutants from industrial facilities. They hired Entanglement Technologies, a California-based firm with a mobile monitoring lab, for $20,000, with the bulk of the funds coming from EDF. “It’s resource-intensive to bring folks from California, but we felt the threat was real enough to warrant it,” Craft said. Jill Johnston, an environmental health professor at the University of Southern California who wasn’t involved in the monitoring, said because the samples were taken over a period of minutes, it’s hard to tell if the elevated levels were brief spikes or representative of longer-term air quality. If those concentrations persist over days or weeks, then the community would be at much higher risk, she said. Bakeyah Nelson, executive director of Air Alliance Houston, said the benzene is an added burden for fenceline communities that already have higher-than-average rates of asthma, cancer and other illnesses associated with continuous chemical exposures. The eastern side of Manchester, where most of the measurements were taken, is wedged between the refinery, two highways and multiple railroad tracks. “This is real stuff, this is not theoretical. If you go there and try to breathe you can literally taste the petroleum and gasoline that’s in the air,” said Mustafa Ali, a former EPA environmental justice official who is now senior vice president of climate, environmental justice and community revitalization at the Hip Hop Caucus. There are families in these communities who can reach through their backyard fence and touch the piping of the nearest facility, Ali said. The Texas Commission on Environmental Quality, the state environmental regulator, has dozens of stationary air monitors across Texas, but the ones in Harvey-affected areas were temporarily turned off during the storm. That’s why mobile, on-the-ground monitoring is so crucial, and the EPA and TCEQ should have “every available unit out there,” Craft said. She was frustrated when TCEQ officials told her in a meeting on Tuesday that a sophisticated TCEQ air monitoring unit has been in Austin since the storm, and wasn’t deployed to Houston. TCEQ spokeswoman Andrea Morrow did not respond directly to inquiries about the unit, but two other environmental advocates who attended that meeting confirmed TCEQ told them it was sitting in an Austin garage. 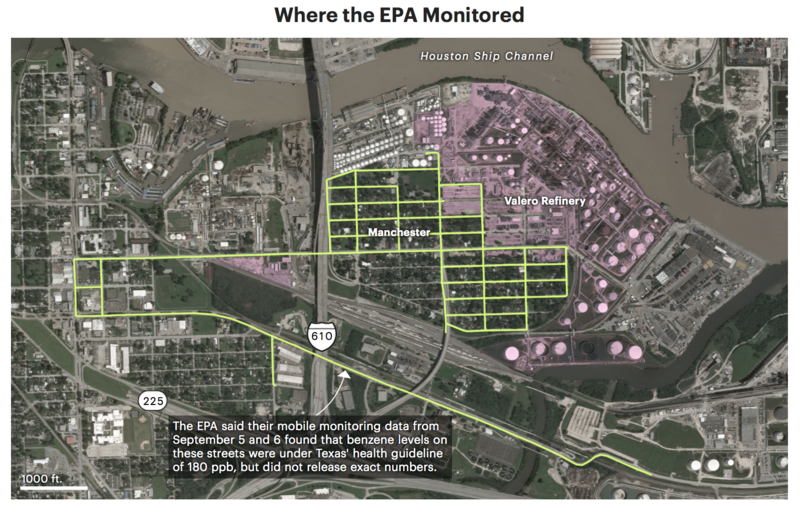 Morrow, in an emailed statement, said TCEQ and EPA investigators have used handheld monitoring equipment to survey facility fence lines, and sponsored aerial surveys to spot potential pollutant leaks. She said TCEQ would release its data once it’s validated. The EPA didn’t respond to inquiries about the detailed data that came from its Manchester monitoring. The agency has posted maps showing additional monitoring it has conducted in other communities, but not the concentrations it found, only that all levels met Texas guidelines. Aside from Manchester, Entanglement found another high benzene reading of 76 ppb at an industrial zone in Port Arthur, several miles from a residential area. Hilton Kelley, a well-known community organizer in Port Arthur, said he noticed “a very pungent odor of sulfur dioxide and other toxic chemicals” during the week Entanglement was monitoring the air. “It makes your eyes water, it stings your sinuses, and it creates a scratchy feeling in your throat,” he said. The Port Arthur area is a hub of industrial activity including a Motiva refinery and an Oxbow facility that processes petcoke — a byproduct of oil refining. In the long-term, Kelley said he wants the TCEQ to put continuous air monitors at facility fence lines in Port Arthur. 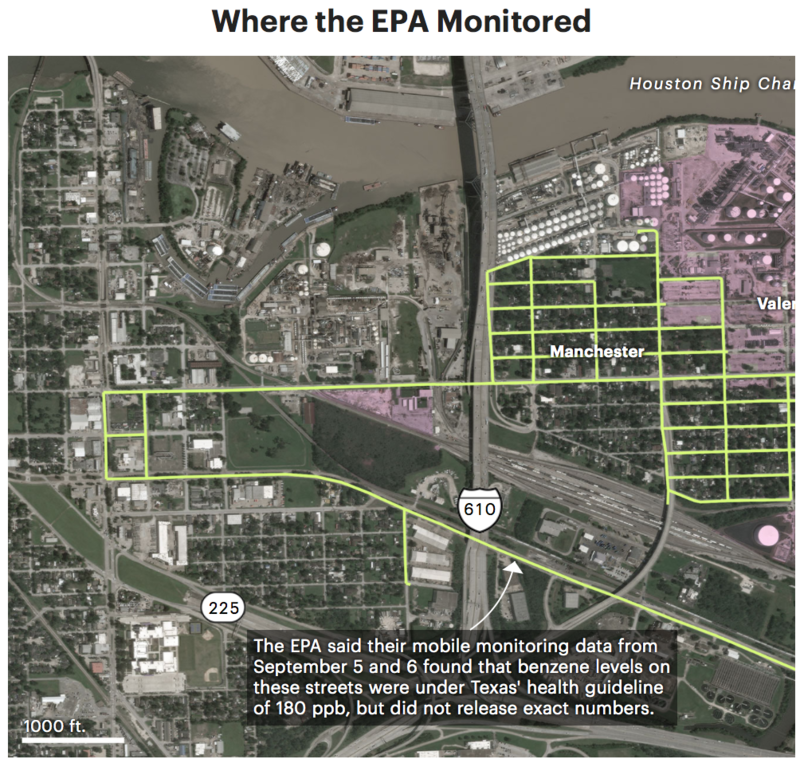 The current TCEQ monitors in Port Arthur only sample benzene and other air toxics once every six days.